While you might have been able to eat whatever you wanted in your teens and 20s without gaining an ounce, those days are often long-gone by the time you hit 35. Aging slowly depletes your body's muscle tissue, which slows your metabolism, and, in turn, causes that all-too-familiar weight gain as you progress through adulthood. 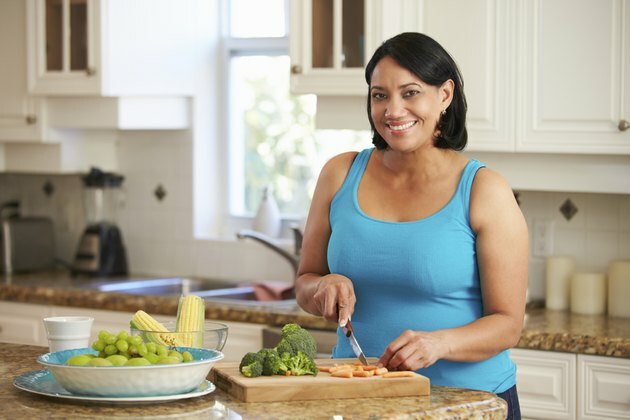 Gaining weight doesn't have to be an unavoidable part of aging, though lifestyle modifications can help you shed those excess pounds and avoid weight-related disease risk as you age. No matter what your age, you'll need to eat fewer calories than you burn to lose weight. However, since your metabolism generally slows down as you get older, your calorie needs change as you age, and the calorie intake that prompted weight loss in your 20s might not work after age 35. Use an online calculator to estimate your calorie needs and get a general idea of how many calories you need to maintain weight. For example, a 37-year-old woman who is 5 feet, 4 inches tall, weighs 155 pounds, and lives a sedentary lifestyle needs 1,935 calories to maintain her weight. That's significantly less than the 2,055 calories she would have needed at age 20. To lose weight, subtract 500 calories from your daily calorie needs to lose one pound weekly; in this case, that 37-year-old woman would eat 1,435 calories daily to shed one pound a week. Resist the urge to cut calories too low, since any fewer than 1,400 calories per day can slow down your metabolism. Remember -- your weight likely crept up gradually over a period of years, so it will take months or even more than a year to lose it. Including lots of protein in your diet can help you shed weight more easily. People who follow protein-rich diets report feeling more satisfied after their meals, according to a literature review paper published in the American Journal of Clinical Nutrition in 2015, so you won't feel hungry and deprived on your diet. Getting 25 to 30 grams of protein per meal seems to be enough for significant weight loss benefits, notes the review. Snack on 3 ounces of sliced turkey breast -- wrapped around low-sodium dill pickles for extra flavor -- for a snack with 26 grams of protein. Or serve 3 ounces of fish -- like salmon or tuna -- with a half-cup of brown rice and 1 or 2 cups of steamed veggies for a high-protein meal that contains over 25 grams of protein. Another key to successful weight loss after age 35 is eating low energy-density foods, like vegetables and broth-based soups. These foods have few calories per gram, so you can enjoy generous servings that leave you feeling full without overdoing it on calories. People who eat lower energy-density foods tend to have an easier time losing weight and keeping it off, according to Penn State University. Load up your meals with large servings of steamed or roasted vegetables, add a handful of extra vegetables to sauces, stir-fries and casseroles to lower their energy density, and fill up on lower-calorie broth soups, like homemade chicken vegetable soups. Consider making substitutions to reduce the energy density of your meal. For example, instead of serving a curry or stir-fry on a bed of brown rice -- which has 218 calories -- serve it on cauliflower "rice," made by pulsing raw cauliflower in your food processor until it forms rice-sized pieces. The cauliflower "rice" is lower energy-density than real rice, so you can eat a whole small head's worth of cauliflower rice and only take in 66 calories. Getting more activity helps you lose weight; it's an easy way to increase your calorie burn, which widens your calorie deficit and helps you shed pounds. Don't jump right into vigorous activity, though, especially if you haven't been highly active since your 20s. Doing too much too soon can increase your risk of injury, aggravate an existing injury or muscle imbalance, and leave you feeling demotivated. You don't want every workout to leave you feeling exhausted and sore the next day. Instead, start slow with moderate-intensity exercise, like brisk walking, and gradually increase the intensity and duration of your walks; for example, alternating walking with jogging, walking a hilly route or simply taking a longer brisk walk. Try strength training using your own body weight; for example, doing body-weight lunges and modified pushups to start building muscle, and graduate to using external weights once you've mastered body-weight exercises. Consult a professional who can design a routine to address any muscle imbalances you've developed in your 30s, as well as show you proper weightlifting technique to keep you safe. Go Ask Alice: Slowing Metabolism When I Hit 30? American Journal of Clinical Nutrition: The Role of Protein in Weight Loss and Maintenance. Should You Eat Pasta to Gain Weight?